How did I discover Palam Market? My maasi (mother’s sister) told me and my mom about this market. Its close by to where I live…around half hours distance so it made perfect sense to check it out. Ever since the wedding got fixed, I had several bad experiences at lehenga stores like in CTC Mall and Moti Nagar. From expensive stuff to rude staff I had seen it all. That’s when my maasi suggested this place. In her opinion, this was a total budget friendly market and one that was not too popular…hence a lot of good options in ethnic wear like suits, lehengas, sarees, gowns etc. I am not sure if many of you have heard of Palam Market (it is located near Delhi cantonment area), it is a decent market to have your trousseau shopping…Though I have got a few sarees from this market before from different stores, this time I discovered a store for budget brides in Palam – Jai Sarees. It’s a destination store for brides which caters to Bridal Sarees, Wedding Lehengas & other fancy outfits. Address: Main Road, Palam Colony, Opp. Pillar No. 62, New Delhi-45. I and my mom had a good experience in this market once before and so we decided to visit this market once again. The first time around, I had bought around 3-4 sarees and 1 suit…all of them were pretty good which made me quite sure that I would find good pieces here. The first thing we did after we entered the store was tell our budget. I was looking for sarees in the price range of Rs. 3k upwards. But honestly, I didn’t really go with anything fixed in my mind. I wanted to have some net sarees, sequins, silk etc and was just browsing through the store. What I liked about the store is that the minute we told them our budget, them immediately went back and came out with tons of saree options for us to see. It was almost as though they were showering us with sarees. We ended up shortlisting 10 sarees, which one after another I started draping for my mum and me to see. Eventually we ended up choosing 3 sarees which I bought. Later I asked the salesman to show some net sarees (I wanted to have one full net saree) and I had no budget restrictions for this one. It was funny, I saw the excitement on his face :D. Somehow its all about the net in Delhi…Seasons after seasons, that’s still the most sought after saree kinds. He asked us to come upstairs. The store is beautiful. Spread across two floors, the space is ample and its not too crowded. The staff is pretty nice to talk to, something I haven’t experienced in the other popular wedding stores. So it was a pleasant change to feel welcomed in the store and overall have a decent experience. They had a LOT of options in net. He started showing all types of net sarees… believe me I wanted to have them all 😀 From my little research, the type of sarees that I wanted was sequins, gota patti, silk saree with embroidery etc… And surprisingly, they have them all ! One of my favorite sarees in the entire store. This is a half & half saree which is horizontally attached. The upper half is chiffon and the lower half is of lace work. I loved the color of this saree, as its just so flattering for my skin type. The minute I saw it, I just knew I had to have it. I have a penchant for pink and my family is quite aware of this. So the minute I smiled at my mom after seeing the saree, she smiled back, and there…I just got hold of my favorite saree everrr! This saree is different in its draping style. Its a two separate piece saree with heavy borders and heavy work. The cream color part is to be worn like a normal saree with pleats and the orange part can be draped like a dupatta. However, I decided to attach the two saree borders to get a single saree (A latkan is also attached, not visible though). It gives a nice heavy look at the waist. However, will detach it after wearing it 2-3 times to get a different look ! What I loved about this saree other than its look is that its versatile and gives me an option to style it differently. One saree in multiple looks is totally worth spending money on. This is again in a pattern of half and half but a single saree look throughout. Pallu is of neon colors (they have this saree in many other colors as well) and the second part is a thread embroidery which is of off- white color. Some pearls are also attached to the embroidery making it more elegant and rich. But the good part is even though they look heavy, they are quite light weight. 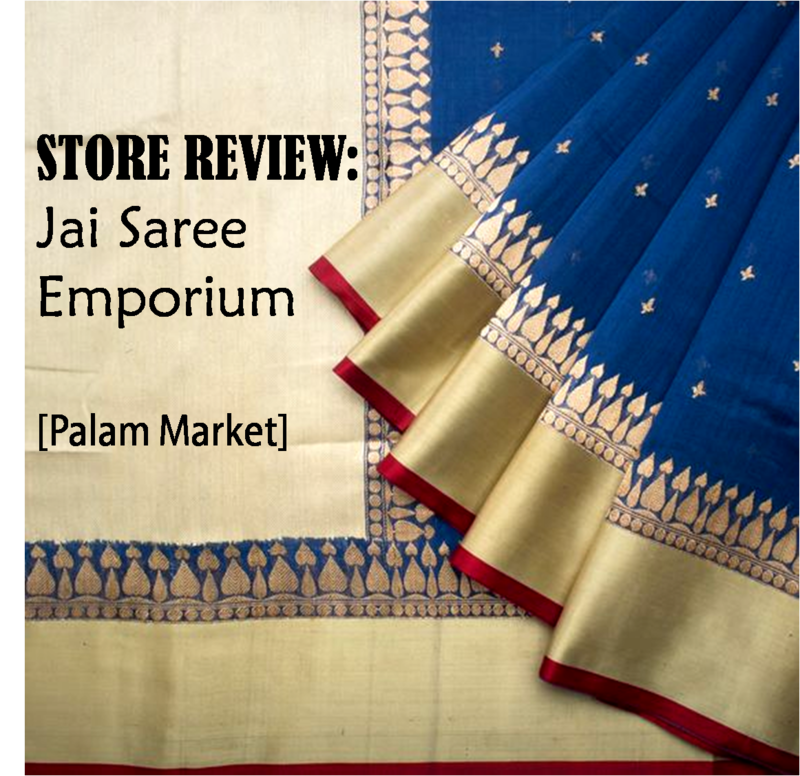 At Jai Saree Emporium…there are a lot of options in gota patti style in varied price brackets. Although I didn’t pick any from here, I did see some beautiful pieces with minimal to heavy work of gota patti. Very pretty, elegant to look at, these light silk sarees are awesome to have one or two pieces in every brides trousseau. The embroidery is done beautifully and it instantly enhances the beauty of the person wearing it. They have a good collection of patterns in silk sarees starting at bare minimum range. They have a varied collection in sequins. Sequins is something that every Delhi bride needs in her trousseau. Its like the go to piece to wear in summers when other fabrics might not work and you still wish to look fabulous. Depending upong the heaviness of the work, you can get sequins sarees in all price ranges. I tried some of the pieces in anarkalis and lehengas, but it was too soon to make up my mind on one. Their collection has everything from velvet to net, and even silk lehengas. Chandni Chowk, Lajpat Nagar etc are now done to death destinations for wedding wear. It would be a good idea to check out altogether a new market. May be you might just get a lucky piece to your liking. If any of you have any wedding shopping destinations that are good for budget brides, do let us know !